Christ - the central figure; He is robed in white to denote His Divinity. In some icons you will see the aureole (elongated halo) encompasses Him, this also symbolizes this brilliant Light; at His feet are the brass gates of Hades which He has demol-ished. Also visible are the keys and broken locks to these gates at His feet. Adam our Forefather - being pulled from his tomb by Christ; he is portrayed as an old man with white hair and beard; the hymns of the Church speak of Adam being "recalled" to his primordial innocence by the Incarnation. Eve our Forbearer - being raised from her tomb immediately behind the figure of Adam; she is portrayed as an old woman; the hymns of our Church speak of Eve being "set free" from her sin in Eden by the Incarnation. The Righteous of the Old Testament - the group of figures on the ex-treme left represents those righteous individuals who lived and died before the Incarnation; the two figures are the Holy Kings, Saint David the Psalmist and his son, Saint Solomon the Wise. The Righteous of the New Testament - the group of figures on the ex-treme right represents those righteous individuals who died after the Incar-nation but before Christ's death and resurrection. Saint John the Baptist and Forerunner is infront of this group. It is the day of Resurrection; let us then make ourselves resplendent for the festival and embrace one another. Let us say, brethren, even to those who do not love us: "Let all be forgiven in the Resurrection, and so exclaim: Christ is risen from the dead, by death He has trampled down death, and to those in the tombs He has granted life. The angel cried to the Lady full of grace: Rejoice, 0 pure Virgin! Again I say: Rejoice! Your Son is risen from His three days in the tomb! With Himself He has raised all the dead! Rejoice, all you people! Shine! Shine! 0 new Jerusalem The glory of the Lord has shone on you! Exalt now and be glad, 0 Zion! Be Radiant, 0 Pure Theotokos, in the resurrection of your Son! The Church teaches that while the body of Christ rested in the tomb on the Sabbath (the day after the Crucifixion), His soul descended into Hades. Prior to the Incarnation the gates of paradise were closed to mankind. Therefore, Hades, not to be confused with Hell, was the place where the souls of all went upon death. It was neither a place of reward nor a place of punishment. It had been likened to Death's "prison" where the souls of both the just and the sinners were confined. Since Christ actually died upon the Cross, Death claimed His soul for Hades. However, Hades re-ceived more than it expected ... it received the Giver of Life, who destroyed the power of Hades. This icon of the Resurrection portrays this concept. 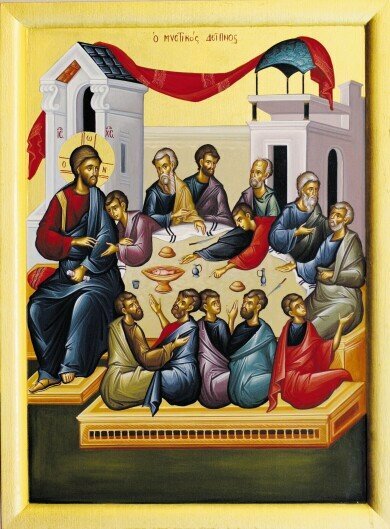 The best way to prepare for Pascha is to participate in the services of Holy Week: Bridegroom; Presanctified; Holy Unction; Holy Thurs-day's Liturgy & 12 Gospels; Holy Friday's Royal Hours, Taking Down from the Cross & Lamentations; Holy Saturday's Vesperal Liturgy. Depending on the ages of your children, attend as many as possible, especially Holy Wednesday and Holy Friday. Pascha is a very special time for children. It is a night like no other night, and they should experience this. You can help them by scheduling their time so that they might be as awake as they can be on Pascha. One way is to awake them about 5:00 am on Holy Saturday morning, then put them to bed about 5:00 PM Reawake them at 10:00 or 10:30 pm to get ready for Church. Include the children in your Paschal Preparations: the preparation of the Paschal foods; readying the Paschal Basket, if this is your custom; selecting their clothes, etc. Prepare to receive Holy Communion as a family. Attend the Paschal Vespers (The Agape Service) on Sunday morning as a family. This service is short and joyful, and especially suited for the youngest chil-dren who may not be able to attend the midnight service. During the 40 day "afterfeast" use the Troparion and Kontakion hymns as prayers before and/or after meals and as part of evening prayers.